And The Award for Highest Growth in Social Media Adoption Is: [INFOGRAPHIC] - SmackSmog! That’s right, folks! In the last 4 years, The Pew Research Center reports that those who are 65 and older who use social media has climbed from 13% to a whopping 43%. Social media use in Boomers has shown the most growth, which is understandable to some degree. Each year as another group of individuals age into the 65+ category, is another year younger that they were exposed to online sites, platforms, and sites. 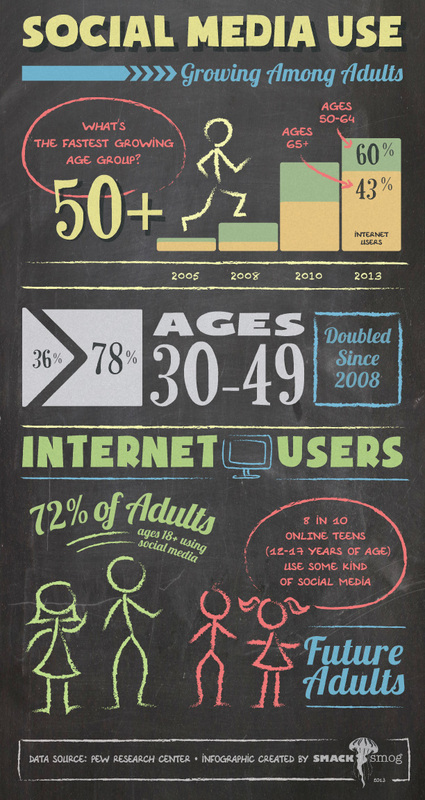 Overall, adult use of social media has risen to 72% (where adults = 18 and older). Another significant piece of data: the 50-64 age group come in with an overall use of social media use of 60%+, though their growth has not been as dramatic as their older brothers and sisters. Also interesting in this report was that Twitter adoption has more than doubled in only 3 years: in 2010 8% of adults used the mircoblogging platform, and now 18% of the adult population use it. So, now what? Here’s what you can think about with this information: who are you trying to reach? How old are your clients, and your prospective clients? To whom (again, by age) are your products and services geared towards? For example, the common thought is that those above 65 aren’t using social mediums very often. That is changing; perhaps newspaper and commercial TV ads may be quite effective in marketing, but now these folks are interacting online. As you think about it, here are these numbers and more in a most colorful infographic. Are you surprised by this data? And how are you using demographic information to shape your strategy; do you regularly keep up with your client demographic/s and their online use? Let us know in the comments!